Are you connected? Sign up to receive our newsletter. Our recipe page is a collection of resources for the family chef who's out of ideas. If you have a recipe to share, send us an email. For your convenience, just click on the title of a recipe to download and print your own copy. 1. In a medium bowl, mix the oil, soy sauce, vinegar, lemon juice, Worcestershire sauce, mustard, garlic, and ground black pepper. Place meat in a shallow glass dish. 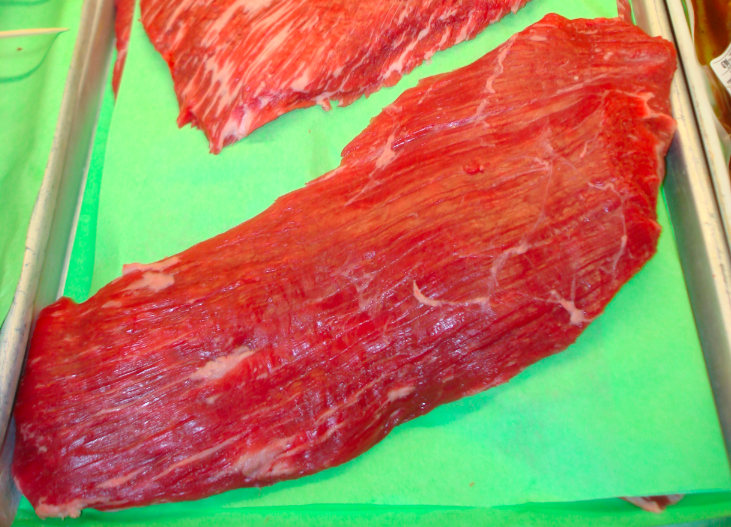 Pour marinade over the steak, turning meat to coat thoroughly. Cover, and refrigerate for 6 hours. 3. Oil the grill grate. Place the steaks on the gill, and discard the marinade. Grill meat for 5 minutes per side, or to desired doneness. •	Add butter, milk, egg and vanilla. Beat on low speed of mixer until all ingredients are moistened. Beat on medium speed 2 minutes. Pour batter into prepared pan. •	In large heavy-bottomed Dutch oven, cook the bacon over medium heat until lightly crisp, stirring occasionally. •	Once the bacon is browned, add the garlic, onions, bell peppers, chili powder, cumin, chipotle chili powder, oregano, and smoked paprika and season with salt and pepper, to taste. •	Cook until the vegetables are tender and seasonings are aromatic. •	Add the beef and break it up with a spoon. •	Once beef is broken up and beginning to brown, add the pork. •	Break up with a spoon like the beef, and brown, until no longer pink, roughly 4 minutes. •	Stir in the beer and beans. •	Toss together, then add the crushed and diced tomatoes. •	Turn the heat down to low and simmer for 1 1/2 hours. •	Taste for seasoning and add salt and pepper, if necessary. •	Transfer the chili to serving bowls and garnish with lime wedges, sour cream, shredded cheese, and sliced scallions. •	Preheat oven to 400°. •	Heat 1 1/2 teaspoons oil in a large nonstick skillet over medium-high heat. Add beef; cook 3 minutes or until browned, stirring to crumble. Drain. •	Wipe drippings from pan with a paper towel. Heat remaining 1-1/2 teaspoons oil in pan. •	Add zucchini and next 6 ingredients (through garlic); sauté 7 minutes or until vegetables are tender. •	Return beef to pan. Stir in wine, tomato paste, Worcestershire sauce, pepper, and broth. Bring to a boil; cook 3 minutes. •	Combine cornstarch and 2 tablespoons water in a small bowl; stir with a whisk. Add the cornstarch mixture to the pan; cook 1 minute, stirring constantly. •	Spoon beef mixture into an 11 x 7-inch baking dish coated with cooking spray. •	Separate breadstick dough into strips. Arrange strips in a lattice fashion over beef mixture. •	Bake at 400° for 12 minutes or until browned. •	To prepare tomato sauce, combine sun-dried tomatoes and water in a bowl; cover and let stand 30 minutes or until soft. Drain and finely chop tomatoes. •	Heat 1 teaspoon olive oil in a large saucepan over medium-high heat. Add sun-dried tomatoes, bell pepper, and onion; sauté 7 minutes. •	Stir in canned tomatoes; bring to a boil. •	Cover, reduce heat, and simmer for 10 minutes. Remove from heat; stir in parsley, basil, vinegar, 1/4 teaspoon black pepper, and garlic. •	Preheat oven to 350°. •	To prepare chicken, lightly spoon flour into a dry measuring cup; level with a knife. •	Combine flour, Parmesan, and 1/4 teaspoon black pepper in a shallow dish. •	Place each breast half between 2 sheets of heavy-duty plastic wrap; flatten to 1/4-inch thickness using a meat mallet or rolling pin. •	Dip each breast half in egg white; dredge in flour mixture. •	Heat 1 tablespoon oil in a large nonstick skillet over medium-high heat. •	Add chicken; cook 5 minutes on each side or until golden. •	Arrange in a 13 x 9-inch baking dish coated with cooking spray. •	Pour the tomato sauce over the chicken. •	Bake at 350° for 15 minutes. •	Cook sausage in large pan, remove from pan and set aside to cool and coin slice. •	Add oil to pan, add garlic and sauté lightly for 30 seconds, add peppers and cook until crisp-tender. •	Combine cooked sausage and pasta sauce with peppers and heat until warm. •	Mix with pasta or serve separately. •	Top with parsley and serve.